Last night a jury ruled that George Zimmerman was not guilty of second degree murder or manslaughter in the shooting death of Trayvon Martin. There was not sufficient evidence to overrule the thesis that Zimmerman feared for his life and used his gun to defend himself. Commentary on the verdict was predictable with liberals complaining about the lack of racial justice and conservatives generally satisfied with the verdict. This week the Illinois legislature voted in a Conceal and Carry law for the State of Illinois, forced upon them by a December ruling of the 7th Circuit Court of Appeals in Chicago. 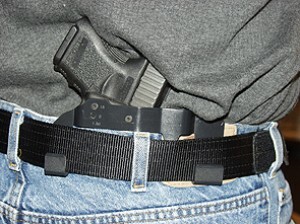 This makes Illinois the last of the 50 states to pass a “conceal and carry” law. In order for a citizen to have the right to conceal and carry a firearm they must pass a background check and take a firearms training course. I haven’t taken such a course, but several of my friends have done so and hold a “conceal and carry” permits in Minnesota. One of the most important elements of the course is the caution that “you should use a firearm only as a last resort to save your life.” You are also taught: “if you use a firearm and kill another human being, the rest of your life will never be the same.” Certainly George Zimmerman’s life will never be the same. A responsible, law-abiding citizen who kills another with a gun may save his life, but will be forever haunted about the incident no matter how justified the circumstances. Most people that kill another, even in self defense, suffer psychological problems afterwards. On review of legal rulings there is another salient fact that comes to the surface; if you’re going to shoot someone, kill him. Had Trayvon Martin become a quadriplegic as a result of Zimmerman’s actions, the public sympathy for his condition would have been enormous. One can only imagine Trayvon Martin pleading his case on the witness stand. Zimmerman would have gone to prison for sure. There is one thing that every lawyer knows but will never say: dead men don’t testify. Legally precedent indicates that if you have a gun and have no question that someone is going to take your life there is only one thing to do… finish the job. The Martin/Zimmerman case will be cited by firearm instructors for many years as a lesson to those who legally carry firearms. Carrying a firearm is an awesome responsibility. I couldn’t agree more. If you choose to exercise your right to carry a firearm you have to make sure you are prepared for the ramifications that come with using it. You have to be prepared to protect yourself, and protect others. You also have to be aware that if you use the tool you’ve chose to carry, you may be taking the life of someone else. It is an incredible responsibility.